Bennett earned a journalism degree from University of Southern Mississippi and an MS in Business Administration. 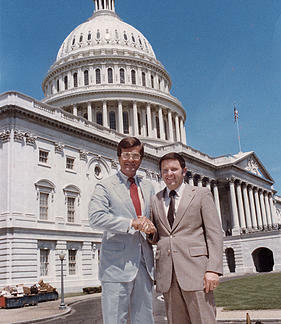 He worked as a Management Intern by the U.S. Atomic Energy Commission (TN), U.S. Nuclear Regulatory Commission (MD), and as a staff advisor to then Congressman Trent Lott (with whom he is shown here), helping develop a national policy for nuclear waste disposal. The last ten years of his career was spent searching for a safe disposal site for high-level radioactive waste—much of this time was spent speaking to State and local governments, American Indian Tribes, and the public. He edited the Jones County Junior College newspaper, wrote for the University of Southern Mississippi Student Printz newspaper, and taught a freshman journalism course at USM. He served as sports copy editor for the Bristol Herald Courier (VA/TN). His professional career included writing speeches for Presidential appointees, congressional testimony, and public relations. He and his wife lead a worship team, teach church classes, and sponsor a home bible study, and visit hospitals and shut-ins. His book, Of God, Rattlesnakes, and Okra: A Preacher’s Boy Tells His Growing-Up Story, won a 2015 Pinnacle Book Achievement Award and has become beloved in his Southern homeland—and is gaining a fan club in the North, too! © 2017 MSI Press, LLC. All rights reserved.